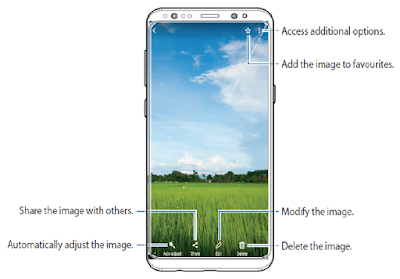 Galaxy S8 Gallery Manual and Tutorials - Learn how to view images and videos stored in your Samsung Galaxy S8 / S8+. 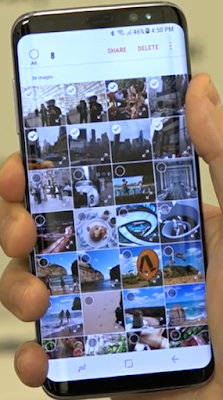 You can also manage images and videos by album or create stories to share with others. Tap Gallery, and tap Pictures, Albums, or Stories to choose the way items are displayed. Tap a picture to view it, or first tap an album or folder, and then tap a picture. Swipe left or right to view the next or previous picture. Tap Favorite to mark the image as a favorite, and then access it from the Favorites album. To start a slideshow with images and videos in the current folder, tap More options > Slideshow. To set the image as the photo for a contact, tap More options > Set as profile picture. 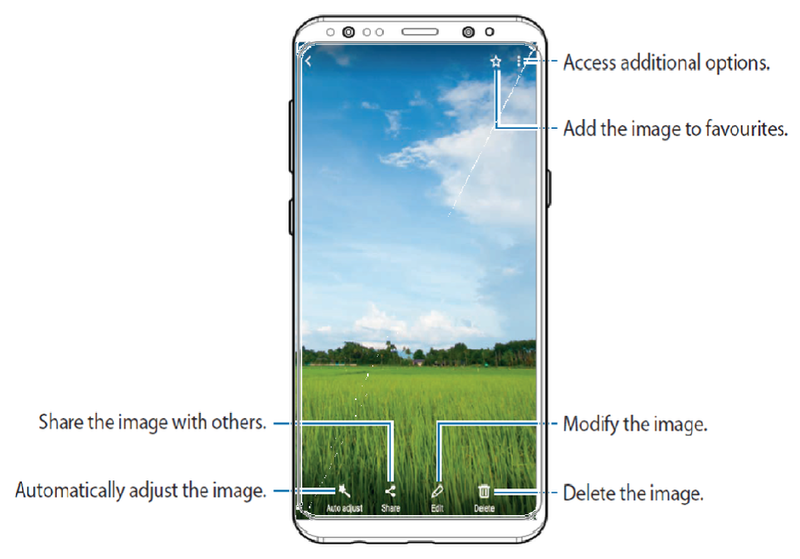 To set the picture as wallpaper, tap More options > Set as wallpaper. To set a picture as the Always On Display, tap More options > Set as image for Always On Display. To send the image to your connected printer, tap More options > Print. Tap Bixby Vision and follow the prompts. You can edit images or picture on Galaxy S8 that you stored on your device. Tap Gallery, and tap an image to view it. Details: View and edit information about the image, including the date created, location, and properties. Auto adjust: Apply adjustments determined by built-in correction software. Edit: View and use the editing tools. More options > Rotate left or Rotate right to rotate the picture. You can play videos stored on your device. Tap Gallery, and tap a folder or category to open it. Tap a video to view it. Tap Play video to play the video. Skip to the previous video. Tap and hold to rewind. Skip to the next video. Tap and hold to fast-forward. Switch to the pop-up video player. Rewind or fast-forward by dragging the bar. 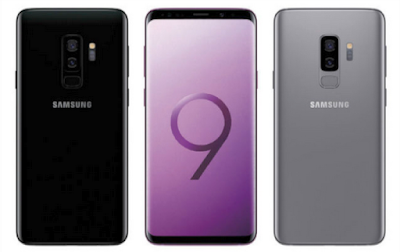 How to edit video on Galaxy S8? Tap Gallery, and tap a video to view it. Trim: Cut segments of the video. Effects: Add visual effects to the video. Audio: Adjust the volume levels and add background music to the video. Movie Maker: Download Movie Maker to edit your multimedia files. Tap Save to save your new video. Enhance the image quality of your videos to enjoy brighter and more vivid colours. On the Home screen, tap Apps → Settings → Advanced features and tap the Video enhancer switch to activate it. This feature is only available in some apps. Using this feature will increase battery consumption. You can share pictures and videos from your Gallery. Tap Gallery, and tap a folder to open it. While viewing a single image or video, tap Share to send it to others or share it with social network services. Share content with specific people directly using the sharing panel from within any app. Tap Settings > Advanced features > Direct share, and tap On/Off to enable. Once enabled, contacts you have shared with in the past will appear as icons in the Share window for each app. You can delete pictures and videos stored on your device. Tap More options > Edit. Tap pictures and videos to select them, or tap the All checkbox at the top of the screen to select all pictures and videos. Tap Delete, and confirm when prompted or when viewing a single picture or video, tap Delete. From any screen, press and hold the Power and Volume down keys. Tap Settings > Advanced features. Smart capture: Capture an image of any scrollable areas of the screen that are currently hidden, as well as the area that is visible, and crop and share the screenshot immediately. Palm swipe to capture: Capture an image of the screen by swiping the edge of your hand across it, from side to side, keeping in contact with the screen.